With ''Adaptive Insights'' companies of all sizes and industries can plan smarter, report faster and analyze better for transforming business performance. 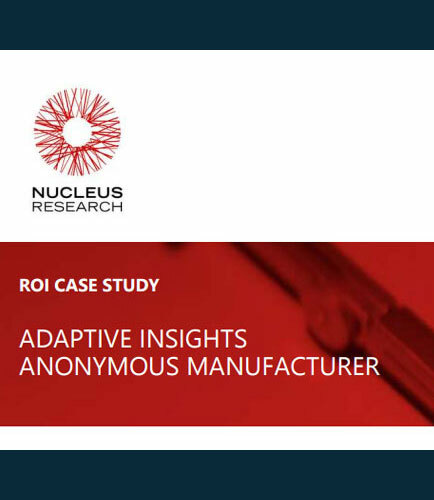 Companies needed adaptive insights to perform financial planning and analysis (FP&A) in a consistent and reliable way across the operations of its plants. The organizations uses SAP and Hyperion for global consolidation, but lackes a common tool to perform planning and analysis at the local level. What are the key advantage of Adaptive insights? How can implementing an Adaptive Planning solution allow managers to create more concise, and accurate budgets and forecasts? How Adaptive Insights can provide better visibility, and the ability to analyze and understand value stream performance? How to evaluate Adaptive Planning based on your organization’s needs? How to quantify and calculate the ROI for company’s investment in its deployment of Adaptive Planning? Purchasing automation eliminates bottlenecks, increases buying power, reduces cycle time, improves inventory management & reduces rouge spending. If your purchasing cycle is automated, the company can expect an improved bottom line, positive impact on corporate spend and purchasing decisions. This whitepaper discusses about how and why to assess purchasing automation savings & solutions. It highlights: Purchasing process flow quickly reveals inefficiencies Boost profits by automating your purchasing functions Guidelines for evaluating software options The future of purchasing and supply Purchasing, a vital company function Within the purchasing function, business has a great opportunity to implement cost reduction in a major spend area and move into the 21st century. If you have not yet automated your purchasing function, now is really the time. What is Returns on Investment ? ROI is a term to determine the loss or gain generated on the particular capital invested. It is basically calculated in percentage and is a big factor when it comes to making financial decisions. It is not same as that of profit, but helps in determining the performance of the business. ROI can be positive or negative.